Traditional patent software solutions have been fairly simple, limited to allowing companies to file more patents and check whether an invention is actually new or not. 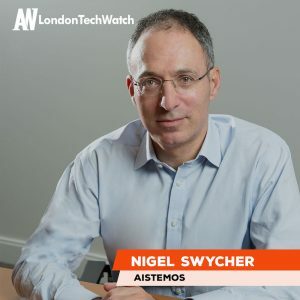 But Aistemos is the analytics company that is taking patent software to the next level through its product called Cipher. Cipher uses AI to identify, classify, and analyse patents in a transparent, time-efficient way, which enables companies to make better business decisions, especially when considering licensing or M&A. 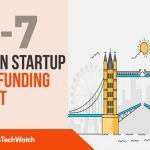 London TechWatch spoke with CEO and cofounder Nigel Swycher to hear about the company’s latest round of funding. Aistemos that it has secured an investment of £3M led by international growth capital investor Beringea. Tell us about Aistemos product. Cipher is the leading provider of patent analytics software. Cipher harnesses artificial intelligence and machine learning algorithms to identify, classify, and analyse patents in ways that have traditionally involved intellectual property specialists in an expensive and time-consuming process. Cipher now supports many market leaders including BAE systems, ARM and ABB as well as a roster of international law firms, investors and academic institutions. What inspired you to start Aistemos? I previously had a long career in the law including 20 years with City law firm Slaughter and May. I found it incredibly frustrating that the information about patent technologies was largely inaccessible, except to specialist teams in offshore locations or within the patent attorney profession. It was abundantly clear that for a range of different use cases such as M&A, licensing collaborations, and risk management the information needed to be more accessible. By combining the very best in data science with an understanding of the problem we needed to solve, Cipher is now the leading IP analytics platform for the world’s most innovative companies. Conventional patent software enables companies to file for more patents, to identify whether the invention is new when compared to what has gone before. Cipher is different in that it is helping companies make strategic business decisions such as mergers and acquisitions, licensing and collaborations in a world that is increasingly being disrupted by technology. These decisions include lawyers, intellectual property specialists but also R&D, corporate strategy, and the board. It is important that intellectual property information is accessible to enable these decisions to be made efficiently. Better information enables better decisions. There are a million companies who own patents across all sectors. Our target market is those companies where intangible assets are of strategic importance. The latest data shows that 80% of enterprise value is intangible assets, so our target market is extremely large. If you narrow this market to companies that spend more than quarter of a million dollars a year on the protection of patents this limits the market to about 50K companies, half of which are in the US and Europe and the other half in Asia. 80% of Aistemos’ revenue is subscription, typically an annual subscription of Cipher, the leading patent analytics platform. The other 20% is consultancy and we provide “supported Cipher” which involves our team of IP experts providing consultancy to ensure that our subscribers maximise the potential from the Cipher software. What is your view on AI potentially running the patent system? One of our major thought leadership initiatives over the last 12 months has been the impact of AI on intellectual property. Cipher’s role is to understand the patent landscape and to answer the foundational question of who is doing what? There is also the potential for AI to help with the licensing and enforcement of patent assets, for example, identifying which companies need a license and also the potential to reduce the friction in patent disputes. 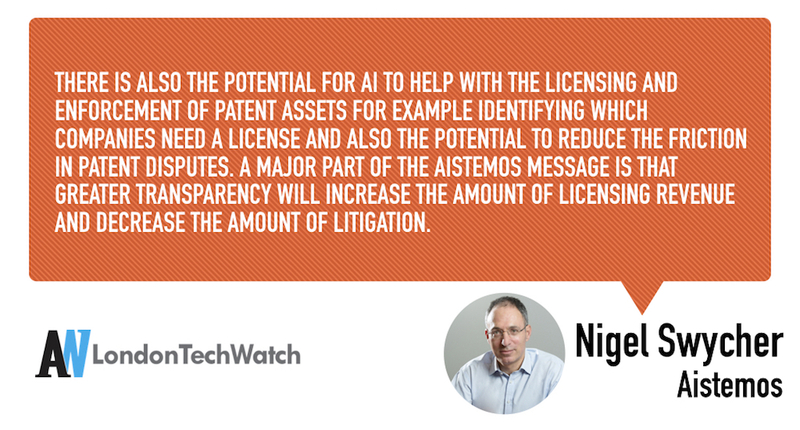 A major part of the Aistemos message is that greater transparency will increase the amount of licensing revenue and decrease the amount of litigation. The initial funding of Aistemos came from a group of EIS investors who have been supportive of the company from the start. The new investor, Beringea, selected us for the reasons they stated in the press release. We look forward to working with them. We are fortunate that with the strong support of our existing investors and a talented leadership team, the capital raising process was relatively smooth. There is no doubt that intellectual property has increased in importance significantly over the last five to ten years and with that has come increased attention on the IP products and services market. This has led to a range of transactions ranging from the multi-billion transactions such as CPA Global and the sale of Clarivate out of Thomson Reuters, but also a number of smaller transactions. 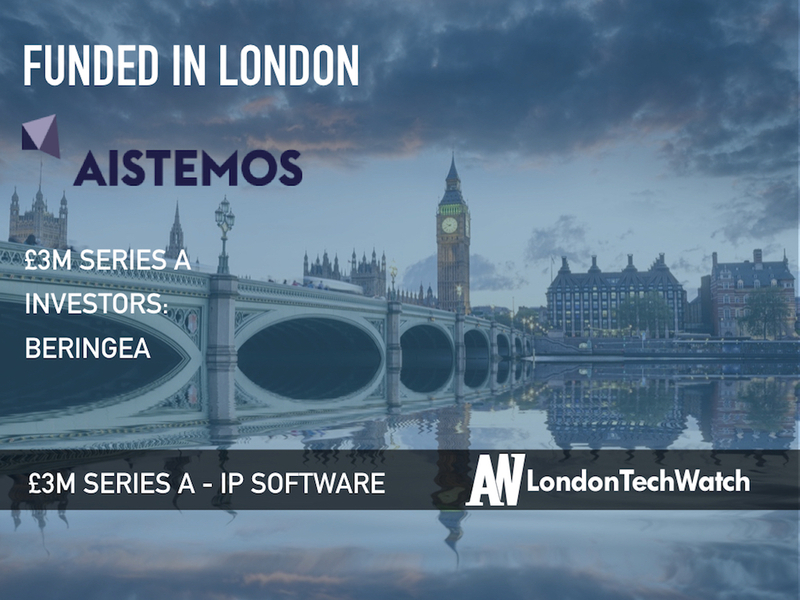 Aistemos is a leading company in the area of AI and intellectual property which also brings in topics such as fintech and automotive disruption. The blend of all of these hot topics is likely to have been important factors to Beringea’s investment. Our plan is to grow the market for Cipher and our sector product Cipher Automotive, the world’s first analytics product to provide analytics to this sector. It is likely that there will be additional sector focused products in the coming year. Everything takes longer than you originally anticipate so plan well ahead. We are very clear on the markets we serve and are fortunate that our customers evangelise on our behalf. We see rapid expansion in the US and Europe in the near term, with the longer-term potential to expand into Asia. I have been running up Primrose Hill for the last 20 years and never get bored of the view from the top.